This is a guest post by author and financial journalist Jonathan Chevreau. Jon is editor of MoneySense Magazine and the author of the book Findependence Day. While the media and the financial services industry seem equally obsessed with the concept of retirement, there is in my view a better more practical goal: one that is far less intimidating for newer investors just starting on their life and financial journeys. This goal is Financial Independence or the short-form I’ve coined that means the same thing: Findependence. Note that Findependence is NOT synonymous with retirement. Financial independence can and probably should precede traditional retirement by a decade or two. In these days of clean and healthy living and good prospects for longevity, it makes little sense to take “early” retirement in one’s 50s, if you define what follows as 30 or 40 years of doing little more than watching daytime television, playing golf and sailing. By contrast, no age is too soon to establish findependence: if you can do so in one’s mid 20s, that’s a good thing, and many technology entrepreneurs have done just that: from Steve Jobs to Mark Zuckerberg to Tumblr founder David Karp, who just sold out to Yahoo at the tender age of 26. The first two did not stop working once their early payday arrived and I’m sure that will also be the case with America’s newest multi-millionaire, Mr. Karp. As I note in my book Findependence Day, Findependence just means that total income from multiple sources – pensions, investments, rental income, employed or part-time work, etc. – exceeds earned income from the traditional sole employer. I define Findependence Day as the day in the future when this magical moment arrives: henceforth you may continue to do exactly the same thing as before, except that deep down you know that you are choosing to continue to work, rather than feeling that one has no choice but to do so because of financial pressure. To me, early findependence is a good thing, while early retirement may or may not be. Findependence means having the freedom and flexibility to pursue one’s heartfelt goals and dreams, without having to make financial compromises merely to make ends meet. Ideally, you want to achieve financial independence “while you’re still young enough to enjoy it,” which happens to be the sub-title of the new U.S. edition and e-book version of the book, which came out in April. (See www.findependenceday.com ). For financial planners and investment advisers, such a paradigm shift would I think benefit their clients: average consumers and investors who use their services. And financial planning is a big component – fully a third – of what I’ve dubbed the Findependence Day model. The other two aspects are online discount brokerages and index investing: either through index mutual funds or exchange-traded funds. And when I say financial planning, I mean primarily fee-only planning, although it can also encompass fee-based planning at least while clients are in transition from the traditional model to this mode of planning and investing. In these days of ultra-low interest rates and volatile stock returns, I believe costs matter more than ever. Online or discount brokerages are one way investors can reduce transaction costs, while ETFs and index funds facilitate prudent diversification while minimizing investment management costs. But the third aspect of the model is also important, despite the perception by many that so-called do-it-yourself investors buying their own ETFs at online brokerages are in no need of third-party advice. In other professions, it’s perfectly natural for consumers to engage lawyers, accountants or physicians on a la carte basis, paying only for services as they are contracted for and provided. It shouldn’t be such a big leap for consumers to view the acquisition of financial advice in the same way, negotiating with the planner for a comprehensive financial plan at such and such a set price, or agreeing to tax and estate planning services on an hourly basis, or perhaps through monthly or quarterly retainers to monitor ETF portfolios and rebalance them yearly. 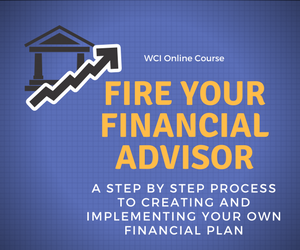 That to me is what financial independence is all about: a partnership with a financial life coach whose vision of your future findependence is perfectly aligned with their own values and skill-sets. You’re reading this guest article on the blog of just such a professional and I thank Roger for the opportunity. And by the way, the book – which some have described as a financial love story – is set in part in Chicago, which is where the action begins. Jonathan Chevreau is editor of MoneySense Magazine and can be reached at jonathan@findependenceday.com. His book Findependence Day is available at Amazon.com, Barnes & Noble.com and Trafford.com. Jon is a must follow on Twitter. You bring up some great points. The goal shouldn’t always be retirement, it should be becoming financially independent. I would love to have enough money by the time I’m 40 to retire, but I’m not sure I’d want to at that point. I would probably switch professions to something I really enjoy doing regardless of the pay. I would imagine having that freedom just makes life a lot more enjoyable. Thanks Jake, but credit should go to guest blogger and financial journalist Jon Chevreau who wrote the post. Thanks Suzanne. Check out Jon’s book, I had a chance to review the U.S. edition before release and really enjoyed it. I have had retirement on my mind for ten years but only had my eyes opened to findependence a few months ago. I was constantly looking at how much I need to retire and the number was huge. I never paid attention to getting my budget to a manageable level and trying to get enough passive income to cover it. This new way of thinking has changed everything and moved my target retirement date up by about 15 years. Thanks for your comment Jon. I think Jon Chevreau’s book provides an excellent framework for thinking in terms of achieving financial independence. I also see the concept of retirement continuing to evolve. I agree about the constant evolution about the “idea” of retirement. You no longer need $10mil in the bank to be happy. You just need 0 debt and enough income to provide for your family. Everything above that is just icing on the cake. Jon thanks for your comment. I agree and I think this is a very healthy attitude to take into retirement. Thanks Jon, great guest post well-received by my readers. PS: planning to visit Chicago in the next month! I never really thought much about retirement. I always feel that I will be working and doing something but I wanted to make sure I was able to work on my own terms. For me I want to hit the financial independence before 35. Still got some time. Very nice guest post! Thomas thanks for your comment. I agree and think Jon’s approach is right on. Great points. We all should aim that, be financially independent rather than retirement. Will visit Jon’s page. Thanks. Thanks for your comment KC. This is a great post here. Very informative. “financial independence” isn’t defined by your debt but by your assets. So if you decide to go on vacation and put it all on a credit card, you’d have debt. But if you could pay off that credit card while living solely on the interest and dividend checks you get from your investments, you’re still financially independent. If you have to go to work to pay off that credit card – working either as an employee or as a business owner – you definitely aren’t financially independent. Financial independence is all about having PASSIVE INCOME. Having a job or having a business is active income. We are mortgage free and except for DD’s orthodontia bill we are debt-free. However, we are NOT financially independent because my husband still has to work. We can’t live off our investments (yet). Thanks for your comment Krist.